In the Jordan rift valley, the continents of Africa and Asia are pulling apart from each other, and the land in between has been subsiding for millennia. 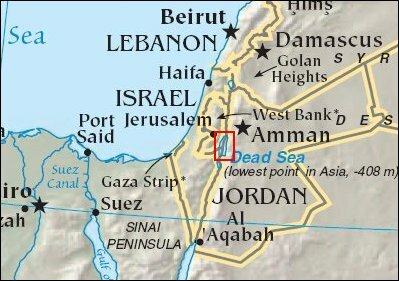 The sinking has created the Dead Sea: rivers (most notably the Jordan River) drain into the deep basin created by the parting tectonic plates. The lake surface is nearly 400 meters (1,300 feet) below sea level, making it the lowest surface feature on Earth. The only outlet for the water is evaporation. 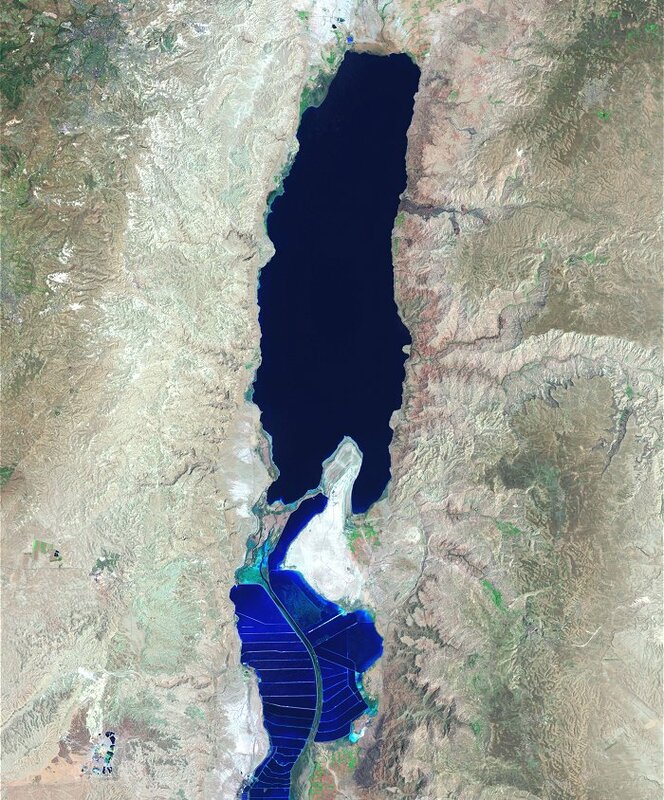 This Landsat 7 satellite image shows the entire extent of the modern Dead Sea on August 7, 1999. Deep waters are dark blue, while pale blue shows salt ponds and wetlands to the south. The pale pink and sand-colored regions are desert lands, while pale green shows vegetation. The mottled mixed of green and purple-gray are urban sites. Long, linear features running across the landscape are major roads. On a hot dry summer day, the 1,035-square-kilometer (405-square-mile) surface of the Dead Sea can drop as much as two to three centimeters (one inch) from evaporation, making the remaining water increasingly salty. In the past, the Dead Sea has been deep at the northern end and shallow at the south. Diversion of the water flowing in to the sea for agriculture in modern times has caused the Sea to separate into two separate lobes. The southern part is mostly dry except for ponds that are used to extract potash (a potassium-based salt) and other salts. In such a parched landscape, fresh water resources are vital to national interests and security. Water diverted from the Jordan River provides agricultural needs for Israel, and water from various streams in Jordan provide for many of that nation’s needs. As a result of these diversions, the Dead Sea has retreated dramatically in the past decades, and will eventually dry up unless a new inflow of water is found. Feasibility studies are underway for projects that would build canals to carry in water from the Mediterranean and Red Seas.